When I think back to my childhood summers, what comes to mind are my mother’s flowerpots overflowing with pansies, geraniums, petunias and marigolds. My favorite flower was the marigold with its fiery pop of vibrant yellows and oranges. It stood out against the pinks, reds, purples and fuchsias like little sunbursts. Pop, pop, pop. When I grew up, I had my own flowerpots filled with pansies, geraniums, petunias, and marigolds. Sometimes, I’d mix it up and put in some lobelia or pot up some dusty miller, but the one constant to be found in those pots was always the marigold. Through the years, I moved away from my flowerpots of annuals and focused more on perennial plantings. I even developed a bit of an attitude towards annuals and considered them a frivolous waste of resources – “oh, yeah, they’re pretty, but with no real substance. Perennials are really the way to go. . . as a serious gardener. . . blah blah blah.” (did I mention that I could be a bit of a pretentious jerk at times?) However, for all my nose sniffing over annuals, I still planted marigolds in my flowerpots and in my yard, along borders or tucked here and there among my perennials. And, I did it for many of the same reasons that others plant their annuals; because they bring beauty into our surroundings; because they create a calming oasis amidst the hubbub of our lives; because they draw us invitingly towards nature. I kept planting my marigolds, never giving much thought about them. It wasn’t until much later that I found out they were more than a pretty face. Those lovely little plants sold in six-sets at nurseries as “color spots” are pest-deterrent workhorses. Marigolds are relatively pest-free and can be planted in vegetable gardens to deter insect pests. They are easy to grow and help keep the away aphids. They also attract beneficial insects such as lacewings, ladybeetles, and parasitic wasps. 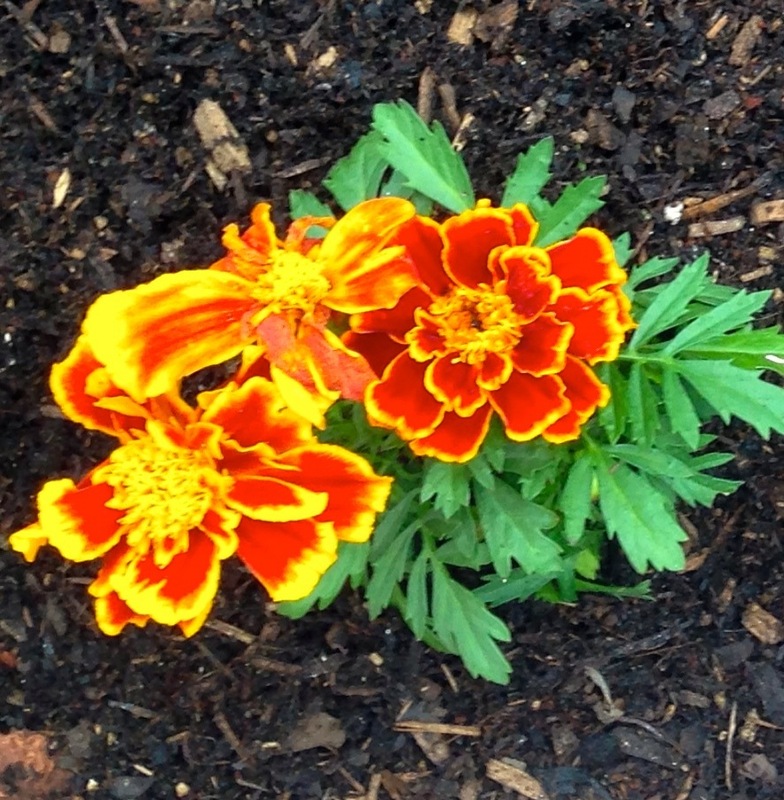 Not all plants can be planted together, but the marigold can be planted anywhere and combined with any plant. Marigolds can deter Mexican bean beetles, squash bugs, thrips, tomato hornworms, and whiteflies. They are also known to repel harmful root knot nematodes (soil dwelling microscopic white worms) that attack tomatoes, potatoes, roses, and strawberries. Marigolds do well in areas with full sun. They require moderate to regular water, but avoid overhead sprinkling on taller plants as stems can break from the weight of the water. Extend the blooming period by pruning off old flowers. If you look around on the internet, you’ll find articles scoffing at the idea that marigolds bring much benefit to the garden. There isn’t a lot of data whether marigolds actually deter insect pests; in fact, there isn’t a lot of data whether any companion plantings deter pests. But, there is some data, and it does support the belief that companion plantings, such as marigolds, do help cut down on garden pests. (See, Washington State University Extension; Iowa State University; University of Vermont; University of Texas; Arizona). This is something to consider as pests become more and more resistant to the many chemical pesticides sold. I’m so glad you brought that up. Yes, slugs sure do like Marigolds. We don’t have quite as many slugs where I live (although quite a few snails), but its a little hotter and dryer here. Also, I live in a suburban community and don’t have the large open natural area to manage as you do. I grow most of my vegetables in raised beds and then scatter the perennial vegetables around the yard; I use pots for most of the herbs and flowers. Because my property is small, its economical for me to use Sluggo, which is a natural, non-toxic slug killer, to help control the slugs, snails. I have found it to work the best for my needs, and I like that its safe around pets and children and that its OMRI listed.